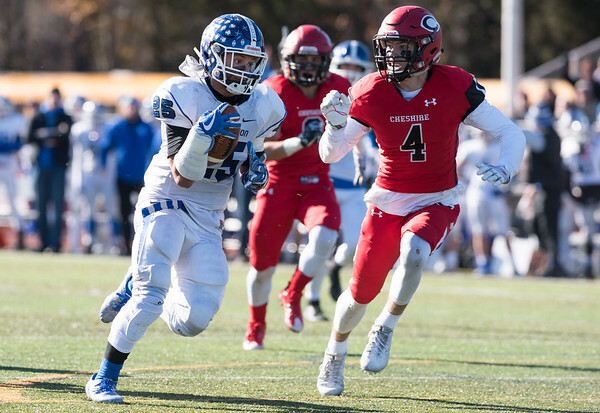 SOUTHINGTON - After his senior season for Southington had ended in 2017, Ryan Montalvo knew he wanted to play college football, he just wasn’t sure where. Following a quick prep year at Trinity-Pawling School in New York, the former Blue Knights standout is heading 45 miles south from where he played high school ball to Sacred Heart University. Montalvo, who is listed at 5-foot-10, 180 pounds, signed his Letter of Intent to play for the Pioneers on Wednesday. He is the only safety Sacred Heart secured on National Signing Day. Last season with Trinity-Pawling, the strong safety finished with 35 total tackles and a sack in seven games. Montalvo also carries the ball 37 times for 161 yards (4.4 yards per carry) and a touchdown. Before his prep year, Montalvo was an overall All-State selection for Southington in 2017 after he recorded 49 total tackles, 3.5 for loss, as a middle linebacker, while leading the team in rushing yards with 574 and eight touchdowns. He missed half his junior season with a torn ACL. Posted in The Bristol Press, Southington on Wednesday, 6 February 2019 21:51. Updated: Wednesday, 6 February 2019 21:53.